You might remember that we recently wrote about Zhao Li Ying taking a break to recharge since there wasn't any news of new projects lately. 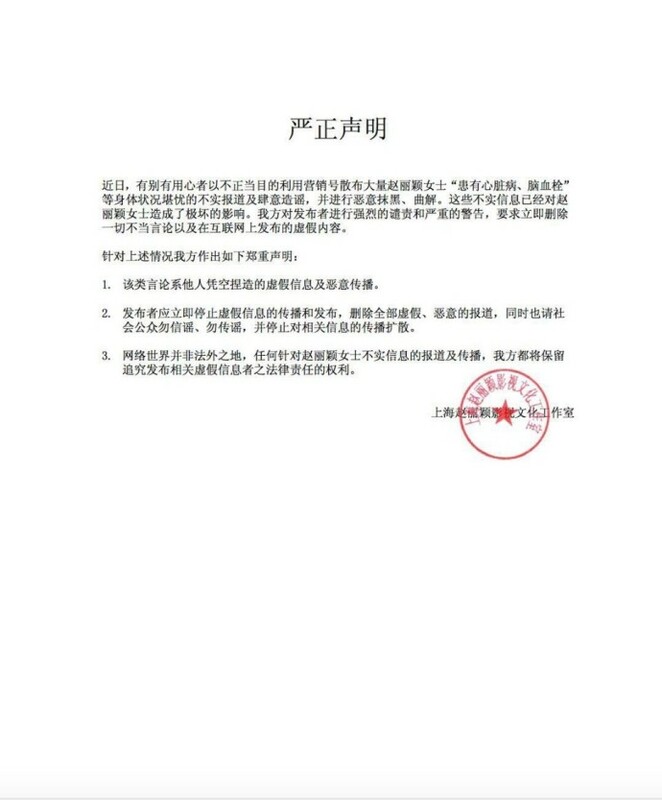 It was revealed recently in an interview with Harper's Bazaar China that this wasn't a voluntary decision. Doctors have warned her about a blood clot behind her brain, a weak heart and several bone injury. Zhao Li Ying reveals that it was from a horseback riding incident where she got thrown off a frightened horse. She didn't go in to see a doctor then because she didn't think the injury was severe. The bone injury did not heal properly and left a big bump on her waist to the point that she would use accessories to cover it up. She also admitted to not eating healthy during filming to which she now regrets. She is now taking the advise of doctors seriously and going on a long break for her bones to heal, her heart to get stronger and I hope she's getting some medication to remove the blood clot in her brain. This is one news that could have gone badly. I am glad she went to see a doctor when she did because it could have been a lot worst. It's a good reminder for us not to abuse our bodies because it does have it's limits. We all need a reminder too that we should get ourselves checked by a doctor even if we are busy. Let's hope for a fast recovery for her. I hope she gets well soon! Zhao Li Ying just recently posted a cryptic update on Weibo. In the update, she commented on waking up early to find such feverish news. She is pissed and wondering if resting before starting to work again isn't normal. Things got a bit clearer once a statement from her studio was released warning about the malicious spread of fake news where it was reported that Zhao Li Ying had a heart disease, cerebral thrombosis and other medical conditions. She's been working sooooo hard these past few years non-stop and it's already reflected in how much everyone loves her + popularity. I am so glad she is taking time off to really rest and listen to the Dr's advice. It was very easy to notice how frail she was during the filming of PA. Just a combination of her injuries, bad eating habits + her hard work schedule is enough to really kill her. So this is good news and she'll come back stronger. I saw her back injury. It’s a big bump. Looks gross. seriously some people hate her just for breathing. Her back injury really looks scary and it got bigger with time. Looks like a herniated disc to me but who knows. Just a very scary protrusion from her back. And she still does a lot of her own stuns which probably doesn't help. To eat healthy, can eliminate refined substances like oil, sweeteners, juice, refined flour, protein powder, salt, etc. which all are not real food. China has told its citizens to reduce animal products by 50% for health and for the environment (should take vit b12 supplement). All animal products have 0 fiber. Her studio was angry about the rumors that she have heart disease and cerebral thrombosis, that it is just fake news. So, according to this article she actually does have some minor heart problem and brain problem but just not serious correct? I dont inderstand why she want to lose weight because she already too skinny?sorry...actually she is not preity at all because she too skinny. She lost weight for her role in PA. She played a slave girl. It’s normal to gain or lose weight as an artist. I'm really glad she is finally listening to the doctors. Your health is your greatest asset. Those are pretty serious injuries for someone who just turned 30. It's good she is taking a break. She has plenty of money and should enjoy it instead of working flat out. 1. Not doing so well in Dior and it might save more face by voluntary quit than being replaced. 2. No matter how famous everyone is (including Yang Mi), their rankings will go down if their drama is not currently airing. But this logic does not apply to zly anyway. Drama airing or not airing, or, work or not working, she remains the highest top 10. And if she her dramas do air, the dramas can be bad but nothing can top the ratings, even if it's Nirvana in Fire. 3. Needs work on her face, each year her chin gets sharper and sharper and netizens became angry since she strongly declared herself natural comparing to others who are not.